Bright lemon vinaigrette and a nutty Parmesan cheese are the perfect combination in this harvest salad. The fruity, nutty, and roasted caramel notes of the Parmesan is a delicious flavor match for the roasted butternut squash and sweet cranberries. Made with Sartori’s Sarvecchio Parmesan, America’s most highly decorated Parmesan. Prep everything ahead of time and drizzle the salad with vinaigrette just before serving. Heat oven to 425 degrees Fahrenheit. Line a baking pan with aluminum foil. Drizzle squash with 1 tablespoon olive oil. Season with salt and pepper to taste; toss to coat. Arrange squash in a single layer on a prepared pan. Bake for 18-20 minutes or until tender, turning once. Cool completely on a wire rack. Combine the remaining olive oil, lemon juice, balsamic vinegar, and a pinch each salt and pepper in a jar with a tight fitting lid; shake well. Set aside. 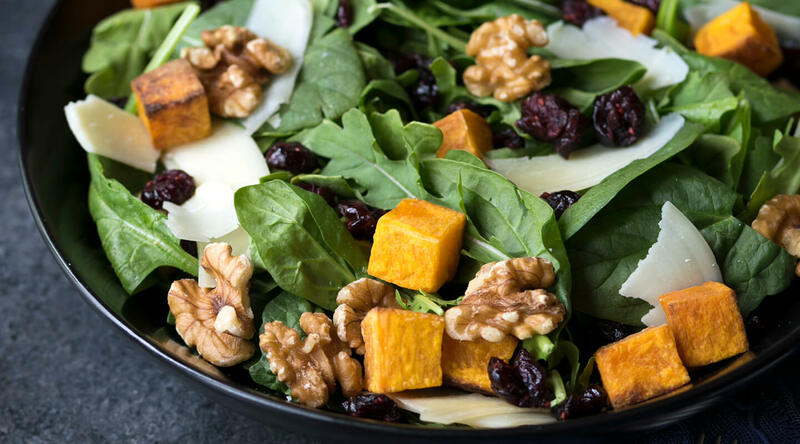 Toss the spinach, arugula, cranberries, walnuts, and squash in a large serving bowl. Drizzle with reserved vinaigrette; toss to coat. Gently toss with Parmesan. Serve immediately. 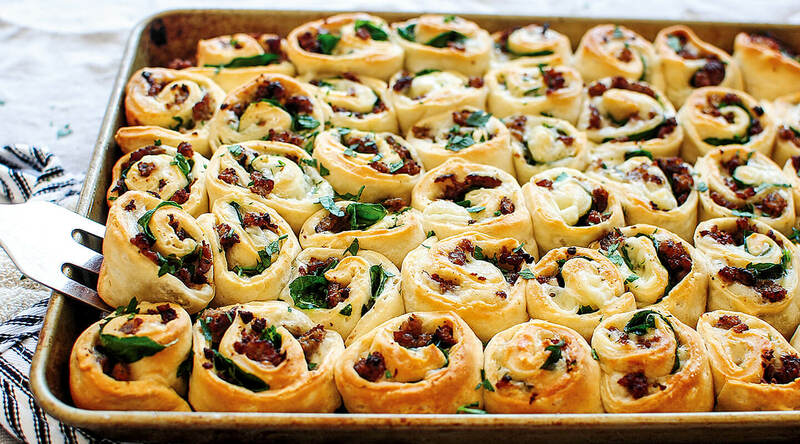 These pinwheel biscuits with sausage and cheese are the perfect finger food. With mild, creamy brick, country sausage, and baby spinach, this appetizer is rich, buttery, and savory. Prep pinwheels ahead of time by following all steps except baking, and bake just before serving. In large skillet, cook sausage until crumbled and no longer pink, about 6 minutes. Place 1 biscuit on lightly floured surface; roll out to 6-7 inches in length and about 3 inches wide. Lightly sprinkle each biscuit with brick, cooked sausage, and spinach leaves. Starting with 1 narrow end, gently but tightly roll up, pinching to close. Use a serrated knife to slice into 1 inch pinwheels. Arrange on baking sheet. Repeat procedure with remaining biscuits. Bake 25-30 minutes, until golden brown on top and cheese is melted. 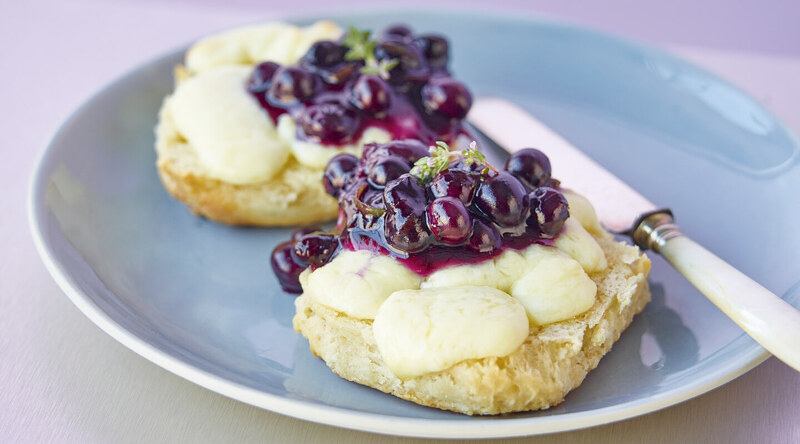 For a sweet option, serve these biscuits with cheese curds and blueberry preserves, the perfect pairing with champagne! Flaky, buttery biscuits topped with warmed cheese curds and fruity homemade preserves come together in perfect harmony with these biscuits. The added thyme to the preserves brings an herbaceous flavor to the dish. Make the preserves ahead of time and simply toast the curd biscuits when ready to eat! Be sure to warm the preserves to room temperature before serving. Warm any leftovers (if there are any!) and serve for breakfast on New Years Day with mimosas! Place blueberries, water, and sugar in saucepan. Bring to boil. Lower heat to simmer and cook until berries soften, give up some juice, but keep their shape. While berries cook, dissolve cornstarch in water. Add to softened berries and continue to cook, stirring, until mixture thickens. Remove from heat and taste for sweetness; stir additional sugar into mixture, if preferred, and stir until dissolved. Add lime juice, zest, and 1 teaspoon thyme. Cool and refrigerate, bringing to room temperature at serving time. Heat oven or toaster oven to 350 degrees Fahrenheit Split biscuits in half. Top each half with cheese curds. Bake 5 minutes to toast biscuits and warm curds. Remove from oven. Top with blueberry preserves and thyme. Serve with blueberry jam. 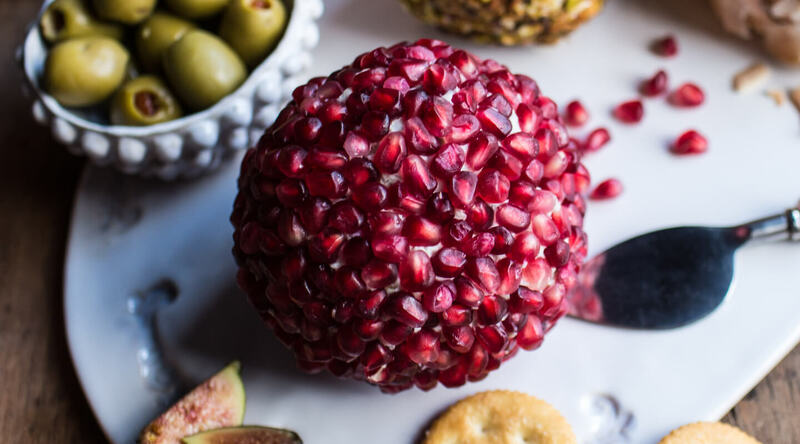 Reminiscent of the Times Square Ball, this Pomegranate Blue Cheese Ball will dazzle your guests with its unique flavor combination. The tart, sour flavor of the pomegranate seeds accentuate the sharpness of the blue cheese, while the cream cheese adds a creamy aspect to the cheese ball. Serve this tart, tangy, and creamy treat with crackers, fresh or roasted pears, apples, figs, and pistachios. Melt butter in skillet over medium heat. Add sage and walnuts. Cook 3 to 4 minutes or until walnuts are toasted. Remove from heat; set aside. With an electric mixer, beat cream cheese, blue cheese, salt, and pepper until combined Fold in walnut/sage mixture. Place large sheet of plastic wrap on countertop; scoop cheese mixture onto sheet; wrap, forming ball, and refrigerate 1 hour. Remove cheese from refrigerator and reshape into ball. Place pomegranate seeds in shallow bowl and roll cheese ball, gently pushing the seeds with your hands to adhere to the cheese ball. Place on serving plate. Serve immediately or refrigerate up to 1 day. 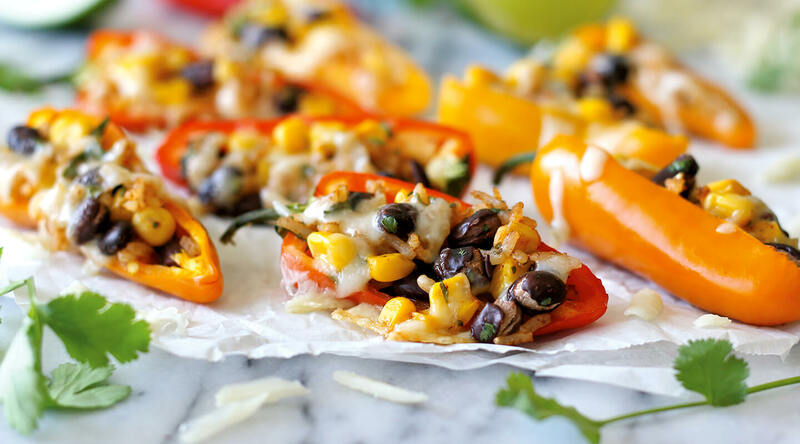 Colorful stuffed mini bell peppers are a hit with creamy, spicy Monterey Jack with Peppers to add some extra zip. Filled with Mexican flavors of cilantro, cumin and chili powder, these flavorful peppers are the perfect snacking appetizer. Fill peppers ahead of time and bake just before serving! Heat oven to 375 degrees Fahrenheit. Line a baking sheet with aluminum foil; set aside. Cut bell peppers in half lengthwise; remove seeds and membranes. Combine rice, corn, black beans, cilantro, lime juice, chili powder, and cumin in a medium bowl. Add ¾ cup pepperjack; toss gently. Season with salt and pepper to taste. Spoon filling into bell peppers. Place on prepared baking sheet. Sprinkle with remaining cheese. Bake for 12-15 minutes or until filling is heated through. Serve immediately.